My column in Business Day yesterday basically questioned the usefulness of the Central Bank’s monetary policy committee(MPC) and its monetary policy rate(MPR), which has remained fixed at 14 percent for almost two years now. I argue that the MPR doesn’t mean much because the CBN doesn’t really implement it but acts differently. My thinking is driven by the graph below. 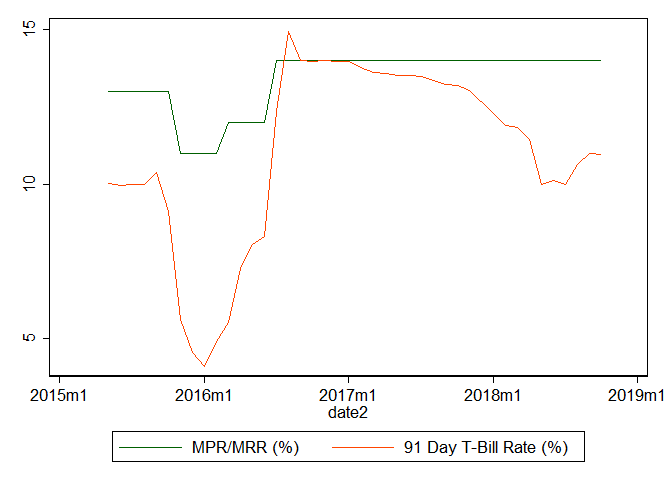 The graph shows the MPR and the 91-day treasury bills rate, a benchmark short-term risk free security issued by the federal government. 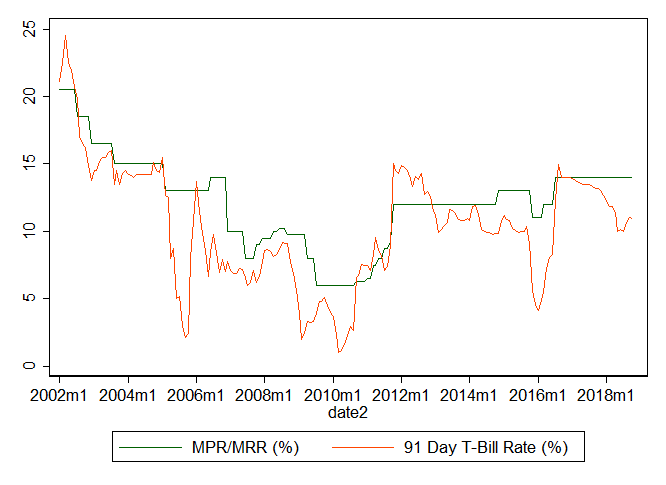 If the CBN really does implement its announcements for the MPR then the rates should track each other. Of course, they will never be identical but the spread between the two would be minimal. 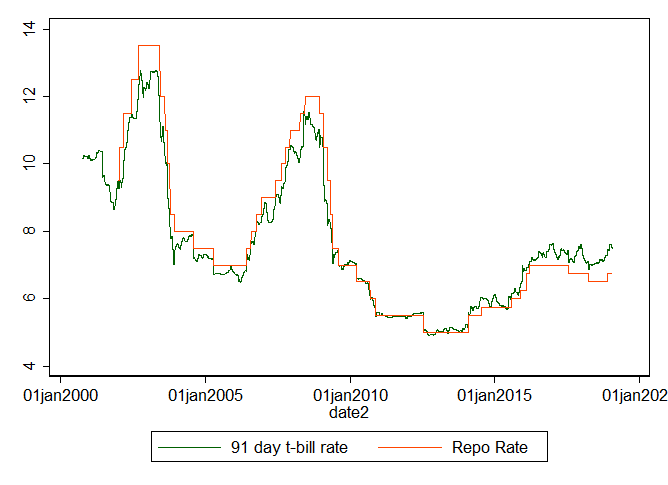 What is interesting is that, at least for the last few years, the rates don’t track each other. In fact, if you zoom in to the last five years then you can see why I worry about the usefulness of the MPC. 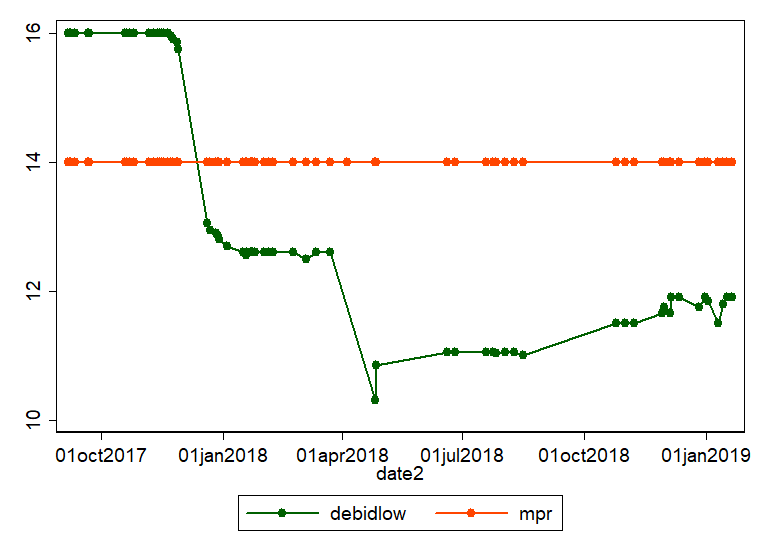 As you can see, over the period where the MPC has officially stuck to its 14 percent holding plan, it has actually gone from tightening, to easing to tightening again. Even the CBNs own OMO securities, similar to the 91-day treasury bills show the same pattern. Compare this to other “credible” central banks like South Africa or the United States and you can see the point. The point of having a MPC and going through the motions of announcing a rate that you actually implement is to show that you are focused on your core mandate of fighting inflation and keep inflation expectation lower, or within you target. Its one of those self-fulfilling prophecy things where if people believe that you are acting and will act to keep inflation in check then it tends to be in check, even in the face of other shocks like exchange rate fluctuations. A recent paper by Kabundi and Mlachila demonstrates this. How large is the inflation penalty for not being focused? I don’t know but perhaps we shouldn’t be trying to find out. I have a monthly economic update which you can subscribe to get my personal thoughts and insights on issues regarding the Nigerian economy. Here.